Born 4 April 1884, Dreghorn, Scotland. An internationally renowned research mathematician, who discovered the E-function. E-function, is part of the basic canon of mathematics and is of great importance as it is used to describe the size of anything growing steadily, from population growth to infection rates. 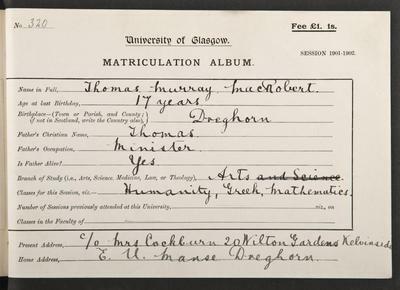 Thomas Murray MacRobert (1884-1962) was a graduate of the University, a Euing Fellow, Ferguson Scholar and William Jack Prizeman who was Professor of Mathematics, 1927 to 1954. He was awarded an LLD in 1955 and he was Dean of Faculties from 1958 to 1961. Born in Ayrshire, MacRobert studied at the University (MA, 1905) and at Trinity College, Cambridge. 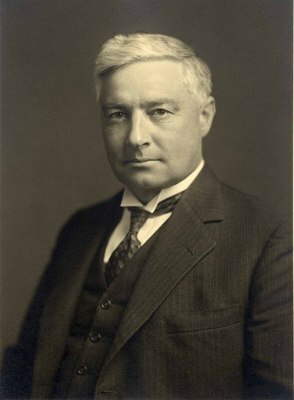 He returned to Glasgow in 1910 as a lecturer and then as Professor, leaving only to serve as a Lieutenant in the Royal Garrison Artillery during the First World War. He won international recognition for his research in a number of fields, most particularly on the hypergeometric function and for his discovery of the E-function. He was a founder member of the Glasgow Mathematical Association.